A recently released two-year breakthrough study estimates the annual direct cost of corrosion in the United States to be $276 billion. While this is a sizeable number, larger than many of the world’s economies, it has been estimated that 25-30% of the total, or $70-80 billion, could be saved by using state-of-the-art corrosion management practices. In addition to the cost savings, corrosion can result in public and industrial safety issues. CC Technologies (Dublin, Ohio) conducted the research in a cooperative effort with the U.S. Department of Transportation Federal Highway Administration (FHWA). NACE International – The Corrosion Society worked with Congressional representatives to secure $1 million in federal funding for the study. 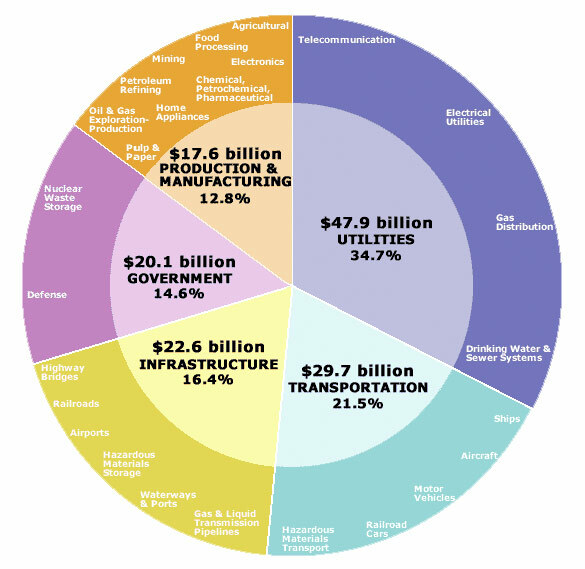 The study identified the direct cost of corrosion in five major sectors of the economy – infrastructure, utilities, transportation, production & manufacturing, and government.